Feral cats may be homeless, but they are not faceless! Meet the cats in our free Barn Cat program, Mother Nature's natural pest control. Why can't animal shelters rescue feral cats? Baywater Animal Rescue provides instruction and loaner traps to help residents humanely trap feral cats. Call us for more info 410-228-3090 or email info@BaywaterAnimalRescue.org. Baywater Animal Rescue spayed / neutered 44 cats in 2017. We also assisted residents in obtaining services for domestic cats through a state grant. Petfinder.com reports that spaying or neutering one cat saves 420,000 lives in seven years, if two survive from each litter. 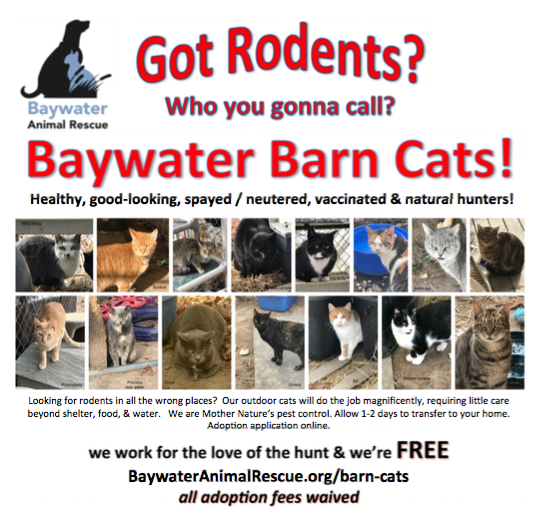 Hard as it is to believe, the 44 cats that Baywater Animal Rescue spayed or neutered could have become 18,564,000 cats in Dorchester County over 7 years! Too scary to imagine! How to prepare feral kitten burritos, an effective (and adorable) way to help a scared feral kitten adjust to human contact.